When it comes to meeting the water needs of a thriving desert economy, the amounts can really add up. Communicating these amounts in a way we can relate to sometimes misses the mark. We've all read or heard something like "That's enough water to fill 200 Olympic size swimming pools." It's not an easy example to imagine, other than to think, "I guess that's a lot of water." Trying to understand water news or even your water bill can be a challenge given the different measurements used. Just like we have feet, kilometers and miles for distance and Fahrenheit, Celsius and kelvin for temperature, water is measured with different units depending on the context. No one would talk about the distance between Phoenix and Tucson in feet and water professionals do not generally talk about the amount of water stored behind Hoover Dam in gallons. Here’s a quick guide to some of the ways you see water measured in media reports, research, and your water bill. Gallon: This is the easiest one but the most important. Everyone knows what a gallon of milk looks like. Nearly all water bills display usage in gallons. The average single-family home in Phoenix uses an average of just over 10,000 gallons per month (more in the summer, of course, and less in the winter). These 10,000 gallons of water per month are a real bargain. They’re delivered to your home ready to drink for one-third of a penny per gallon. If average cost-conscious water consumers tried to replace the water service to their homes with generic refillable five-gallon jugs at their local grocery store, their water bills would be around $2,500 per month. Not to mention the transportation costs of moving over 2,000 of those jugs. MGD (million gallons per day): This measurement is used most often in the context of water delivery and sewer systems. For example, the City of Goodyear recently announced it would construct an eight “mgd” water treatment plant to treat a portion of its supply of Colorado River water. An average flow of just one mgd is enough water to supply nearly 3,000 average single-family homes in Phoenix annually. 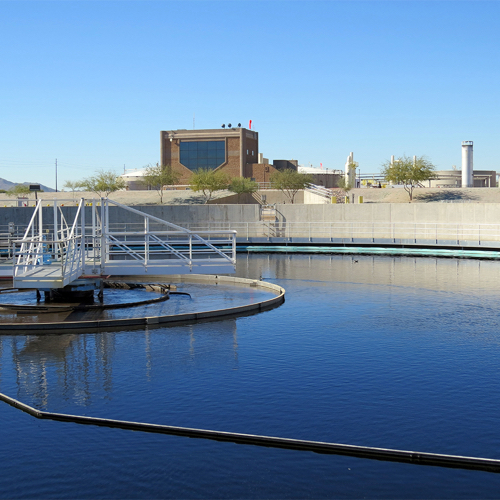 On the larger end of the scale, the state’s largest wastewater treatment plant at 91st Avenue in southwest Phoenix treats an average of 140 mgd but has the capacity to treat 230 mgd. Much of the treated wastewater from this facility is used to cool the Palo Verde Nuclear Generating Station. AF (acre-foot): This measurement takes a little imagination. It is the volume of water it would take to cover one acre of land in one foot of water - or 325,851 gallons. If it helps, it takes two “AF” to fill an Olympic-sized swimming pool and is how much water three average Phoenix metro households use in a year. Acre-feet are usually used to measure huge volumes of raw, untreated water, such as how much water is in a reservoir. Here’s an incomprehensible number: each year 1.5 million acre-feet of Colorado River water flows through the Central Arizona Project canal delivering a renewable supply of water to Arizona’s cities, industries and farmers. ccf (centum cubic feet): For us non-Latin speakers, “ccf” is 100 cubic feet. One hundred cubic feet would fill a 5-by-5 feet box that is 4-feet tall - or 748 gallons. While most AMWUA cities calculate water bills in gallons, if you receive a water bill from the City of Phoenix and examine it closely, you’ll see it is based in ‘units’ of water with each unit being one ccf. The average Phoenix single-family home uses 13.6 ccfs per month. Why use ccfs and not gallons? The city’s old water meters were designed to track your usage in ccfs and it is too costly to change the billing system. cfs (cubic feet per second): “Cfs” is used to measure rates of flow, such as in rivers, canals, or large pipes. For example, the Mississippi River discharges an average of 600,000 cfs into the Gulf of Mexico. The Central Arizona Project canal, by comparison, delivers an average of 2,100 cfs to the state’s cities, industries and farmers. Cfs numbers vary widely depending on their context but even very low numbers can really add up. Consider this, a flow of just one cfs means 7.5 gallons every second. A flow rate of only one cfs over the course of a single day equals the amount of water used by about five average Phoenix single-family homes during an entire year. Understanding and relating to water information is crucial to participating in the ongoing discussions about how Arizona can ensure we all have clean, reliable, affordable water supplies. Numbers make up a big part of that discussion.